Please be aware, it can not look and function same as original. It is a compromise. Skinning can only do so much. Tried with CSM 4.1.0 on Win7/8. Not compatible with most older versions of CSM. Will only partially work. Exit CSM, restart CSM, and go to "Start Menu Style" tab. Pick Classic or Classic two columns. Pick "XP Blue BBT" in Skin tab. If you want to have at least the power button on the blue bottom, click on the Extend right text. It can not be white text, unless Ivo has some overide trick in CSM settings? 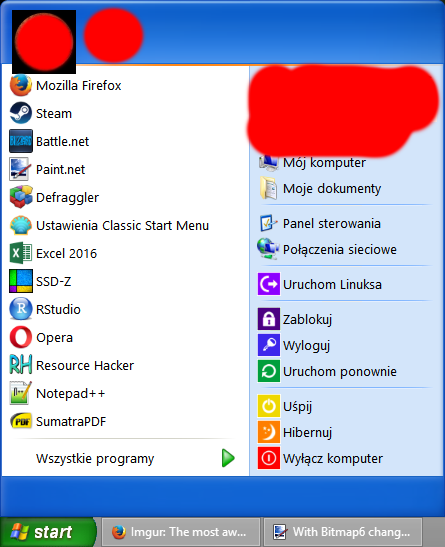 in the Customize Start Menu tab, and drop it just above "search box". This will give a buffer space for item button above it. ps This is only the blue XP. Green and silver not included. File size at 1.38MB already. I cheated and put a screenshot of real XP menu in bitmaps. The alternative variation was a blend of original, Classic Shell, and my own. and upload the improved menu to share. and change opacity text to "fullglass". hitting the log off button, and losing my work, I pass. "There is a "Confirm Logoff" option in the Start menu settings". Note. The extended bottom paddings will not work in Hi-DPI. RevB removed large green arrows on split buttons, added face variation. Last edited by juniper7 on Sun May 29, 2016 1:04 pm, edited 2 times in total. Here's mine. To get it like this, I had to extend the left and right borders, and add log off directly after programs. 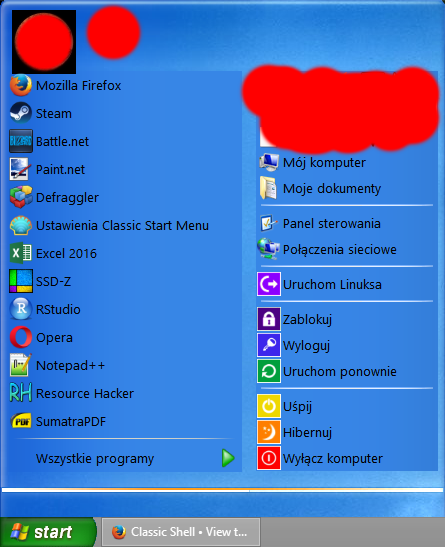 XP's All programs doesn't have an icon, so I typed "none" (without the quotes) to get it blank. And to get the buttons on the left to have the blank space on the bottom instead of the top, I had to add empty buttons below the rest of the things on the left. All that's missing is being able to add white text to the bottom, removing the arrows after log off and shut down--while still keeping the sub-menus--and separating the log off button from the left row, so that it can be more to the right, like it is on XP. First I thought-piece of cake. So easy, until I switched to small icons. All yucky spacing. Took me a day just to sort that one out. Yep, I messed around with a lot of things as well. I made buffer/padding icon buttons, with bitmap picture inside of bottom border. These were placed to be invisible, to push the log off, and power icon buttons to proper areas. with the exact invisible cutout lettering, to let it show through as white when selected. But of course, as the menu shrank and expanded, it went way out of alignment. These are not on uploaded menu. It had to be as simple as possible for others to use. could be assembled as a rectangular icon button? I just noticed both our menus have different separators from real XP. Original is shorter and snubbed out. Yours looks better. getting even closer requires a lot of head scratching. I don't like the sight of blood. The weekend is over, and it's time to go. Nono, you totally helped me. :) This is just my configuration of your skin, that I posted for reference for everyone else. Well, I wouldn't mind having it. I'm actually spending more time making Windows 7 look like XP than I did using XP. :P It's fun to me. I assume it's different because I'm using it with a third-party Windows XP skin. And sadly, Icons have to be square. I wish Classic Shell didn't require changing so many things into limited icons, but then again, at least we have it. Windows 7 (and especially 8) would be a nightmare without it. Maybe GauravK or someone could try and fix some of the issues we noticed? Hey that's nice and quite an effort, juniper7! And that's a clever idea, Weboh to move Log off below All Programs. It almost looks like the XP menu except for the differences you both pointed out. on the blue bottom border, fine. ..For me, after accidentally hitting the log off button, and losing my work, I pass. There is a "Confirm Logoff" option in the Start menu. How can I change the shortcut key? When I make it say Turn off Computer instead of Shut Down, I lose the ability to press U to open the shutdown menu. The ampersand character (&) defines the shorcut key. Don't download, unless you like to tweak CSM settings. Will not look good, straight out of the file box. Bottom text will be all jumbled and scrunched up. This is another version, my last attempt. At one time the bottom lettering was clear type. This one looks like original XP chunky text. There is no way to make like original. If I squint my eyes from 15 feet away, it kind of looks like old xp. 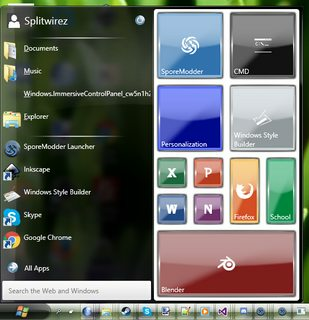 requires lots of manipulation in "customize start menu settings". Check out picture for visual instructions. so add more blank spaces in between the & and &. At bottom, it is only the icon buttons that will be highlighted with mouse over, not the icon and text. or say the face of a blue girl staring at you. If you know how to use Resource Hacker, you will find a test bitmap of her. She is really airbrush hood painting on a VW beetle. Credits to painter. unless real 32 bit selector bitmaps are put in place. ps Thanks GauravK, concerning the log off confirm option. After reading your comment, did a menu search, there it is. ps Weboh, I tricked myself. I'm thinking wow, that person is really good. The menu name is like mine too. The only differences are the ends of the right separators. Last edited by juniper7 on Sun May 29, 2016 1:37 pm, edited 3 times in total. Does this sound like an interesting project for next weekend? Me thinks that's more than a weekend. How about 20 years project! Added xml file to make it easier to use skin. Just save .xml file to location of your choosing. Click on backup button at bottom of CSM settings. Pick "Load from XML file", open the "XP Luna BB xml file. This will roughly set up the functions/look. Only problem with this way, is every menu will follow same configuration. You will need to "Reset all settings" to use a different menu skin. Last edited by juniper7 on Sun May 29, 2016 1:38 pm, edited 2 times in total. Hey guys, I'm new here on the forum . I've only just discovered this XP skin, and it's awesome!! The only thing is, when I changed the skin and loaded the .xml settings, I don't get the log off and the turn off computer icons aren't showing - and I can't even click on anything. I know it's been ages since you've been working on it, but maybe you guys could help. Do I need to use a specific version of Classic Shell? I'm using CS version 4.2.1 on Windows 7 Enterprise. By the way, there is only a small square around where the icons would be, that is active. The text is just dummy text, imbedded in the menu picture bitmap. Nothing will happen, if clicking on text. I don't have Enterprise version to test it. Looks like you are going to have to manually find the icons, in a different .dll location in Enterprise, with "Customize Start Menu tab". or download them to folder on drive, and instruct CSM to find them in that folder. Sorry, I wish I could help further. Last edited by juniper7 on Sun May 29, 2016 1:39 pm, edited 1 time in total. Post subject: How to add a complete row for xp menu? I want to make an additional row for the log off button. I have tried it several times, but still didn't make it. Where can I add an additional row for the log off button? Post subject: Re: How to add a complete row for xp menu? The short answer is that you can't. To do that, add a new custom item and add the buttons as sub-items, as if you are making a sub-menu. Then in the custom item's properties, check the setting "Insert sub-items as buttons". "XP Luna BB revB .skin" used along with " XP Luna BB revB.xml"
The xml file has to be loaded into CSM for it to work. You would need to reset "User name text" in "Menu Look" tab of CSM, as well. We also tried another non button method too. That is the first post "XP Blue BBT revB"
Last edited by juniper7 on Sun May 29, 2016 1:25 pm, edited 1 time in total. Just remembered, this girl is still hiding in the XPLuna BB file from way back. Last edited by juniper7 on Sun May 29, 2016 1:13 pm, edited 1 time in total. @Juniper7, would it be possible to update it for high DPI? Would that be to adjust the icon position bottom padding, for the DPI 150% auto feature? to make the non stretching parts look better proportion 150% to the text menu area? I'll look at it, on the weekend. with my, not so great picture software. I might be able to use a feature in Windows 10 to make sharp resize, without blurred lines. And I said in a post last week, that I'm taking a skinning break. Can only work in 3 sizes 100%,125%,150%, nothing else. For Classic 1 & 2 Columns. High Dots Per Inch experiment. Only available at 100%,125%,150%. Other percentages will not work properly. and everything else has to be adjusted to compensate for it. it really is qty 12 menu bitmaps! It would be qty 36 menu bitmaps to have all colors. Too much work, so there is only the blue menu in this zip. Not sure if this is going to work correctly, or not on a different computer. See PS below, for possible odd bug. It has regular size XP menu with the text & square buttons on the blue bottom. Has option to switch to 125%, so the text/buttons line up properly. In Windows 125% setting-it works. In CSM setting to 125DPI-buttons go out of alignment. It is not same as percentage. Starting point of 96 dpi = 100% So to get the extra 25% CSM would need to be 96 x 1.25 = 120 DPI. Then it works properly. If CSM detects 150% text size, it turns on automatically to proper proportions. In CSM, that would be 144 DPI setting. It can be quite picky about the exact required amount! Maybe wasted two days on it. Best to use Windows size adjustment in "Display Settings". Well at least try it once, then delete if not happy. Note. The " XP ICONS.zip" name is a bit misleading. It has skins, .xml file, and XP icons all inside. 1.Unzip the "XP ICONS" folder. Put it straight into Drive C.
2. Copy the "XPLuna TXT HDPI.skin" file, and put it in the skins folder of Classic Shell. 3. Open up CSM settings, select "XPLuna TXT HDPI" in "Classic with two Columns" style. 4. Click on the "Backup" button at the bottom of CSM settings. Click on "Load from XML file"
Open the "XPLuna TXT HDPI.xml" file in the XP ICONS folder. 5. Lastly, reset user name text in "Menu Look" tab, to default. This should set it all up, so the original XP icons are showing on second column. If all this fails on a different computer, sorry, did the best I could. I put another skin file (XPLuna ST HDPI.skin) & (XPLuna ST HDPI.xml) in the XP ICONS folder as well. It is just the Standard (ST),skin. Does not need matching xml file, unless you want the XP icons. which in some cases is better than a lot of tweakin with DPI. Just before uploading, I noticed something weird about the "custom menu" item in "Customize Start Menu" section. I have a custom menu item sandwiched in between column padding, and shutdown dialog. It keeps the run button from going on the blue bottom. When 2nd column icons are turned on, custom makes an invisible space. Good. But when no icons option is turned on, the custom space dissapears! Huh. unless you put lots of items in first column. Last edited by juniper7 on Sun May 29, 2016 1:34 pm, edited 1 time in total. Looks sharp and in place buttons at 150%. Thank you. This is suzie copycat menu for CSM. From way back in 2001. Someone changed the color of Luna XP to this rich purple. Difficult searching on internet. I don't even know who made it, to give credit to. I've had it forever. The only purple menu I could use longer than half an hour. There is a way to make the text active, you just have to add a few extra shutdown dialogs and it will just be a few squares covering the text so you can basically hit any square and it will work normally. Last edited by skeleton11223 on Fri Oct 20, 2017 6:09 pm, edited 2 times in total. There is a way to make the text active you just have to add a few extra shutdown dialogs so it will just be a few squares covering the text so you can basically hit any square and it will work normally. I think I understand what you did. There are no icons showing in your picture. So they must be referenced to an invisible icon. The only purple menu I could use longer than half an hour. Does not appear that I can upload the original msstyles suzie file, even in a zip. Just goes to refresh page? Even the Wikisend free file sharing service is being red paged banned by MS. I'll try again tomorrow night. Microsoft doesn't ban files from being uploaded... maybe the archive is corrupt? try creating a .7z or .rar file instead? Microsoft was blocking the wiki site with smartscreen filter. Big red page. .rar uploads Hope you have WinRAR? Finally, never happened before with this site and zips. Could extension be turned off for uploading? Making both columns roughly equal width, does cause a bit of a problem, when inside submenu tree is used. Kind of narrow cramped! I would suggest to turn on "Large font" option. The Tahoma font doesn't make taller text, but rather w i d e r spread out text. This makes column 1 wider. If using flyout submenu, does not matter too much. Can always increase the default value of "Programs pane width" in CSM settings. Problem with that is, the user picture that is set for 1st column, floats around, not locked in position. That part is an experiment. If it bothers you, switch to default right position. Text looks sharper with Font smoothing off. Now that All Programs arrow is so XP big, hard not to notice. Why does the arrow point opposite way for inside menu? Does not make sense to me. and point to Back, for returning back to normal view. Better not go against the flow, will leave as is. Reason was, if menu at top taskbar position, user picture would drop inside menu. Now it stays within it's vertical boundaries. Still don't know how to separately trigger search bitmap to show bigger images for HiDPI. So I maxed out the 16 pixel space with bigger XP magnifier. Last edited by juniper7 on Sun Jan 01, 2017 3:15 am, edited 2 times in total. It is the XPLuna7 HiDPI.skin7, with added fake icons added in second column. The SS stands for ScreenShot. I had to make and paste many screenshots to get the images lined up. Also, the icon pictures are stuck that way always. Can't rearrange. to assign the proper matching links, and separator positions. Otherwise, 2nd column will be a muddled mess! You can still put your own language text in second column. Just try and keep the same width of start menu, or the left user picture could disappear. And set up your command/link in "Customize Start Menu" tab. Last edited by juniper7 on Sun Jan 01, 2017 3:18 am, edited 1 time in total. What can I say juniper7 except it's perfect and high quality and a lot of hard work!! The magnifying glass icon for search / (x) icon when we begin searching is smallish at high DPI. Everything else is perfect!! Can you PM me your PayPal so I can show my appreciation by donating some amount? The magnifying glass icon for search / (x) icon when we begin searching is smallish at high DPI. to switch to the second enlarged line of search images in the search bitmap? Tried with an enlarged bitmap. Didn't work. Got lucky with an enlarged pin bitmap on Hidpi, because it divides evenly. Edit: Turning on large fonts switches to second line of images of search bitmap. Don't know how to trigger without large fonts, with or without a search bitmap. Seems to get the threshold with main text size. Will leave as is, unless the main text size can stay same. Last edited by juniper7 on Fri Dec 09, 2016 1:12 am, edited 1 time in total. Hey, thanks! This is beautiful! I have a huuuuge collection of XP themes, and now it's that much bigger! XP was awesome for skinning. Yeah, I love plugging in my old XP drive, to revisit those themes. Remember DarkSide (really dark), and Sentinel X(Really well done, angled metal with color) ? Only HiDPI 150% I cut out the 125% size. Gaurav had already made an impressive Classic 2 style, all in one skin. This is the 7 Style version of the same skin. Same type of skin with the additional icons image in second column. To get it working, the xml file has to be loaded, to align the second column. Same deal with the entries stuck that way. No rearranging. Can only add a couple extra at bottom. Thanks juniper7. Your skins are always polished and it's a challenge porting classic with two column skins to 7 style but you do a superb job. For sake of completeness, these are an excellent addition to the collection of skins we have here in the forum. The position of the user picture in this skin when shown in the left column seems to be dependent on the setting "Programs pane width". It shifts left/right depending on whether the value of this setting is decreased/increased. Yes, the offset picture frame was an experiment that Splitwirez, and I played with. We both knew it wasn't a good fix. 7 style will always center the picture, so we made the bitmap super wide, with the frame offset at the end. About twice as wide as menu. Can only work for one exact width of menu. I even made several different widths to accommodate small options, High Dpi, etc. If frame is on right side, only the second column affects the float width, and is a bit more stable. Nothing can be done to lock it in one position. Luckily that option can be turned off. ...should I stop making these dumb not-really-warranted references to Start9? ._. I mention your name, and you suddenly appear, like magic, with a very glassy Start9. I figured we would never hear from you again, being hunkered down with coding . The extremes we go to, just to get around the Windows law. Measuring one of the Hidpi user bitmaps, an astonishing 988 pixels long. In coding the Start9, does that mean you can override the position restriction? Hey, I see you use Blender. and by selecting straight/premultiplied, the rgb channels brighten up to normal view. Too bad I did not know about UV image editing capabilities before. Can anyone help me with enlarging profile picture in this skin? EDIT: By "this skin" I mean XP Blue BBT from opening post. and replaced Bitmap6 and Bitmap13 with bigger ones, yet it doesn't work. No idea what to do next. I tried to change various padding values but it didn't help. That skin has a number of variations with different bitmaps. There might have to be other main bitmaps to change to taller type. Do you see anything at all, like part of frame, or user picture? I will check in again tom. This is how it looks without Bitmap6 changed. Just need to enlarge the blue part at the top, so profile pic doesn't look so displaced. Pretty sure I'm just messing up something with Main_bitmap_slices_Y, but I'm also sure the values in *.bmp file and my edits to the skin are the same. As I wrote earlier, I have added 16 pixels to original Bitmap6 file and changed 66 to 82 in Main_bitmap_slices_Y=66,1,42 I must understand it wrong. Have not looked at the revB file for awhile. Variation 4 Transparent top/bottom with face two column with picture has Main_bitmap=28 with different dimension slices. along with same user picture frame User_bitmap=13 for all variations. Its frame is 52 pixels high. Ok, now trying to figure what I am seeing in your pictures. For first picture, the main menu bitmap looks like variation 2 with flatter bottom. The second picture, I might be wrong, looks like variation 3 altered transparent main menu bitmap. The vertical slices don't look right. See my picture where the vertical slices should line up. Your picture frame, black part show 64 pixel height. It's ashame you put the red over the user picture. Does user picture show, and just hiding it? Kind of looks like you want a round user picture? and use this text instead. Can add a (frame) User_bitmap to be above with a different number. If all I have said is too confusing, upload your modified skin and we can see if we can get it working the way you want.